Action Park in Vernon, New Jersey—which first opened in 1978 and closed in 1996 after earning itself the nicknames "Traction Park," "Accident Park," and "Class Action Park"—reopened last year. And though it's only been back in business for a season so far, the people in charge are already making daring decisions: They're attempting to bring back the infamous Cannonball Loop, a waterslide that was open at the park for just one month during the 1980s. I remember being ecstatic when I had cleared the pinnacle of the loop, however the worst was yet to come. Apparently my sub 100 lbs. body was not heavy enough for the ride and rather than sticking to the slide on the back end of the loop, I actually fell to the bottom of the loop. I smacked the back of my head on the slide and was nearly knocked unconscious. It was then I saw light as I sputtered out of the exit of the tube [...] I was able to orient myself enough to get to my feet and smile with pride as the stunned crowd cheered for the little kid who just went down the most dangerous water slide of all time. It was closed again within minutes and although I went to the park a dozen times after that day I never saw that slide opened again. Action Park wants to recreate the ride—but in a safe way! Dubbed the Sky Caliber, the new ride is planned to be unveiled in 2016. It has a 45-foot drop, complete with a 30-foot loop; riders are expected to zoom through at 50 miles an hour. For safety, park-goers will be fitted into pods that resemble roller-coaster restraints. The apparatuses are supposed to give the rider enough speed to complete the loop. 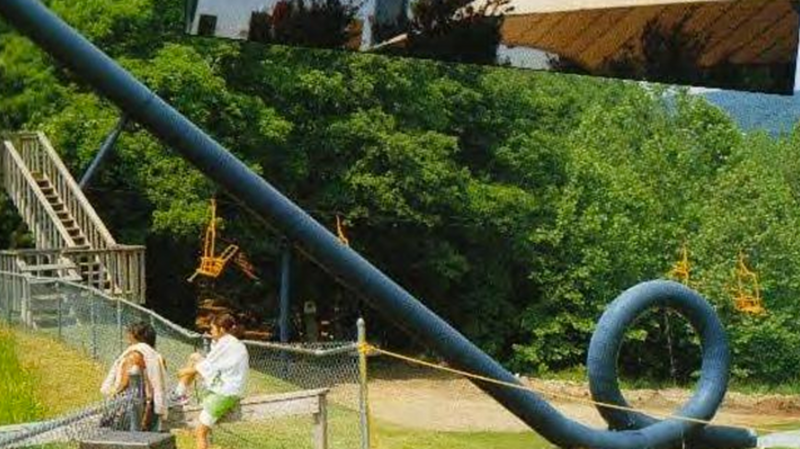 The original Action Park came by its nicknames for a reason: According to Weird NJ, the Herald said a staggering 110 injuries—including 45 head injuries and 10 fractures—were reported in 1985. Weird NJ puts emphasis on "reported," because allegedly, the park often did not report the injuries that occurred. According to io9, there were at least six deaths at the park. Construction of the new loop can't start until necessary approvals, but a prototype has been created. Benneyan even got a chance to ride it. "Everybody in every sport wants to do a full 360 ... and the original Cannonball Loop was a backyard approach to that," he told NJ Advance Media. "These guys have figured out how to do it right. It's a heck of a ride. It rides like a dream."